6:00 am – Arrive Lao Cai train station. Change to mini bus for transfer to Sapa hotel. Travel time approx 1 hr. 12:00am – Trek through Y Linh Ho village with Black H’mong tribe. 2:00 pm – Keep trekking through lush rice – terraces towards Lao Chai village to experience Black H’mong people’s daily life and traditional culture. 3:30 pm – Arrive into Ta Van village inhabited by Zay minorities. Exhibiting strong Chinese culture where we have dinner on a wood fire enjoying the company and hostility of our Zay family and home stay overnight. 8:00 am – Breakfast at home stay. 9:00 am – Trek through bamboo forests to Giang Ta Chai waterfall, bridge and village inhabited by Red Zao minorities for a short break to enjoy stunning view surrounding. 12:00 am – Keep trekking into the village of Red Zao minority. 8:00am – Breakfast at home stay. Explore their village, a beautiful waterfall, hot spring. 9:30am – Begin trek to the remote village called Nam Toong, inhabited by Red Zao tribe, enjoy spectacular view surrounding. 12:00am – Return to Ban Ho for lunch. 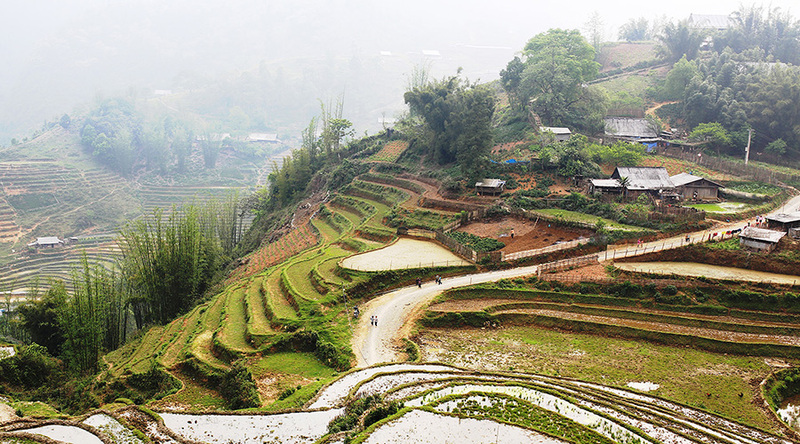 12:30 pm – Keep trekking up hill to Ban Den village for bus pick up and transfer to Sapa. 5:30 pm – Bus transfer back to Lao Cai train station for the night train back to Ha Noi. Note: Please bring along a good pair of walking shoes, raincoats, jackets, inspect repellent and sun cream.